Walter Cushing was born perhaps about 1865. "United States Census, 1880," database with images, FamilySearch (https://familysearch.org/ark:/61903/1:1:MH61-SHH : 24 December 2015), Anna Cushing in household of Henry H D Cushing, Medford, Middlesex, Massachusetts, United States; citing enumeration district ED 406, sheet 166A, NARA microfilm publication T9 (Washington D.C.: National Archives and Records Administration, n.d.), roll 0541; FHL microfilm 1,254,541. Rev. Valentine Cushman was born perhaps about 1808. Elizabeth died on November 15, 1993 in Hull, Massachusetts, at age 89. 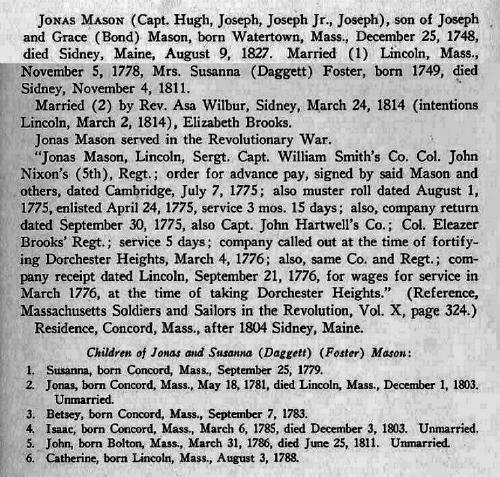 "Massachusetts, Births, 1841-1915," index and images, FamilySearch (https://familysearch.org/pal:/MM9.1.1/FXF2-Z3Y : accessed 24 Nov 2012), Lydia A.W. Bartlett in entry for Elizabeth Bartlett Cutter, 1904. "United States Census, 1940," database with images, FamilySearch (https://familysearch.org/ark:/61903/1:1:K4XV-LNK : accessed 15 December 2016), John F Cutter, Ward 2, Newburyport, Newburyport City, Essex, Massachusetts, United States; citing enumeration district (ED) 5-281, sheet 4B, line 66, family 84, Sixteenth Census of the United States, 1940, NARA digital publication T627. Records of the Bureau of the Census, 1790 - 2007, RG 29. Washington, D.C.: National Archives and Records Administration, 2012, roll 1587. "Massachusetts Births, 1841-1915," database with images, FamilySearch (https://familysearch.org/pal:/MM9.3.1/TH-267-11396-14648-86?cc=1536925 : 1 March 2016), 004383935 > image 838 of 1155; Massachusetts Archives, Boston. William Richard Cutter, Genealogical and personal memoirs relating to the families of Boston and eastern Massachusetts, New York: Lewis historical Pub. Co., (1908) , p. 1288. She was the daughter of Simon Daby and Joanna Hale. Town and City Clerks of Massachusetts, Massachusetts Vital and Town Records, Provo, UT: Holbrook Research Institute (Jay and Delene Holbrook), , Note that the "1810" in the listing is a sequence number, not the year. He was the son of Simon Daby and Joanna Hale. Town and City Clerks of Massachusetts, Massachusetts Vital and Town Records, Provo, UT: Holbrook Research Institute (Jay and Delene Holbrook), , Note that the "1788" and "1789" in the listing are sequence numbers, not years. Thomas W. Baldwin, Vital records of Harvard, Massachusetts to the year 1850, Boston: Wright & Potter, (1917) , p. 258. Thomas W. Baldwin, Vital records of Harvard, Massachusetts to the year 1850, Boston: Wright & Potter, (1917) , p. 29. J. H. Temple, History of North Brookfield, Massachusetts: Preceded by an Account of Old Quabaug, Indian and English Occupation, 1647-1676; Brookfield Records, 1686-1783, , at https://books.google.com/books?id=Aj0vGKe_JegC . The Town of North Brookfield, (1887) , p. 665. Simon Daby was born on May 20, 1765 in Harvard, Massachusetts. On June 18, 1795, he married Betsy Whitcomb in Harvard, Massachusetts. On May 13, 1798, their daughter, Sally, was baptized in Harvard, Massachusetts. 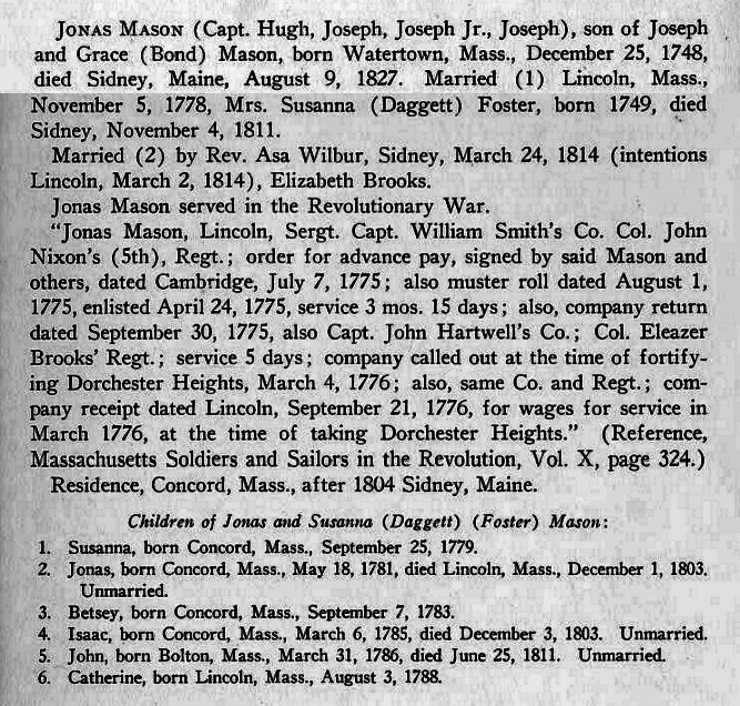 Simon died on December 18, 1802 in Harvard, Massachusetts, at age 37. He was buried after December 18, 1802 in Old Cemetery, Harvard, Massachusetts. Vital Records of Lincoln, Massachusetts To the Year 1850, Boston, Mass. : The New England Historic Genealogical Society, (1908) , p. 109. Concord, Massachusetts Births, Marriages, and Deaths 1635-1850, , at https://books.google.com/books?id=vs8UAAAAYAAJ . Boston: Beacon Press, ([1891?]) , p. 248. Concord, Massachusetts Births, Marriages, and Deaths 1635-1850, , at https://books.google.com/books?id=vs8UAAAAYAAJ . Boston: Beacon Press, ([1891?]) , p. 249. The census of 1920 shows: Cora Parker Dame listed with Mildred Florence Merrill and Frank Herman Merrill Jr.
Merrill, Cora P. Mrs. boards 100 Wenham. Merrill, Cora P. removed to Lynn. "New Hampshire, Marriage Records, 1637-1947," index and images, FamilySearch (https://familysearch.org/pal:/MM9.1.1/FL8L-QXP : accessed 29 Oct 2012), Herman F. Merrill and Cora Parker Dame and null, 1909. Massachusetts Births, 1841-1915", database with images, FamilySearch (https://familysearch.org/ark:/61903/1:1:FXWN-QRC : accessed 13 April 2016), Cora Parker Dame, 1890. "United States Census, 1920," database with images, FamilySearch (https://familysearch.org/pal:/MM9.3.1/TH-1951-22913-4611-36?cc=1488411 : accessed 14 April 2016), Massachusetts > Essex > Danvers > ED 30 > image 42 of 60; citing NARA microfilm publication T625 (Washington, D.C.: National Archives and Records Administration, n.d.). "Massachusetts, Births, 1841-1915," index and images, FamilySearch (https://familysearch.org/pal:/MM9.1.1/FXJF-5WR : accessed 29 Oct 2012), Herman F. Merrill in entry for Mildred Florence Merrill, 1909.